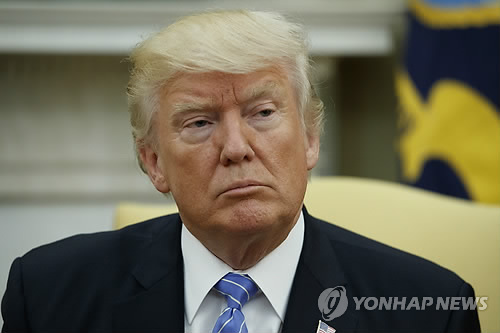 WASHINGTON, July 5 (Yonhap) — U.S. President Donald Trump on Wednesday questioned the sincerity of China’s efforts to pressure North Korea, pointing out a sharp increase in the country’s trade with the communist neighbor. “Trade between China and North Korea grew almost 40% in the first quarter. So much for China working with us — but we had to give it a try!” Trump said in a Twitter posting. It was Trump’s latest expression of frustration after months of fruitless efforts to persuade China to exercise more of its influence as the North’s economic lifeline to rein in the regime. China accounts for nearly 90 percent of the North’s total trade. Trump’s frustration appears to have deepened after the North stunned the world with its first test Tuesday of an intercontinental ballistic missile apparently capable of striking the United States. Since then, the U.S. has downgraded China’s human trafficking status, blacklisted China’s Bank of Dandong as a primary money laundering concern, and approved the first arms sales to Taiwan since Trump came into office. These contrasted sharply with April’s decision not to label China a currency manipulator in order to avoid hurting Chinese feelings at a time when the U.S. was asking for its help to bring the provocative regime in Pyongyang under control. China is North Korea’s last-remaining major ally and a key provider of food and fuel supplies. But it has been reluctant to use its influence over Pyongyang for fear that pushing the regime too hard could result in instability in the North and hurt Chinese national interests. Analysts doubt how far China can go in pressuring Pyongyang, saying China has often increased pressure on the North in the past, especially when Pyongyang carried out nuclear and missile tests and other provocative acts, but it never went as far as to cause real pain.